Over the last year we've planned, scheduled, and now completed (almost!) an addition of about 330 sq. ft to our house. For those of you who might have missed my previous posts on planning this addition, you can find them here and here. It's been a huge undertaking, and I promised to share a little bit of our journey here on the blog....so here it goes! 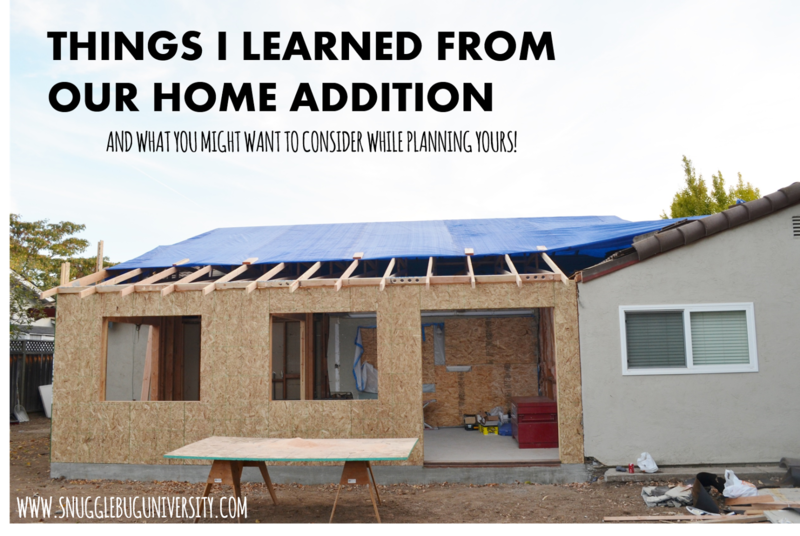 Here are some things that I learned throughout the process, and things that you might want to be aware of if you think a home (or remodeling) project is in your future. I've also included some pictures throughout the process including some sneak peaks of what it looks like now. One of the questions that people often ask me is how long the whole process took. About 99% of the work was done in three months, from October through December. This doesn't include my backyard, which currently needs to be landscaped (we are taking that on ourself). All in all though I think that the process took so much longer than that. It's been about a full year since we started planning our project, securing funding, getting plans drawn and approved through the city, and then finally the construction. We hired a contractor who was well recommended by a few friends who had had work done on their houses. This contractor also had a good relationship with our city. I've heard horror stories about contractors before, so I knew how important it was to have a reputable one. That said, I don't think I fully appreciated certain aspects about choosing a contractor until after the project was finished. We had a few bumps along the way, and there were times where we had to work out issues with our contractor. Good communication, the ability to work out problems, and keep a level head are all so HUGELY important characteristics in a contractor. Bottom line: choose a good contractor with a level head, because if your project is large enough you will have problems, and you will have to negotiate through them. There were a few moments in our project where things could have gotten so messy--and they didn't, purely because everyone involved kept a very level head. Keep on track of your project. I have very little experience with construction, so I felt somewhat intimidated by the whole process and in some ways wanted to just leave it up to my contractor to mange. I quickly learned though that even with a good contractor, mistakes happen. Catching these mistakes earlier on saved time and money. Ask questions if things don't seem right. 5. Think ahead. I've always wanted skylights in our kitchen because I'm pretty obsessive about having natural light in the house. We thought we might have to add these later (when budget allowed) but ended up stretching and including them. In the end, I'm glad we did. It turned out that thinking ahead was critical here. Had we not added them at this point we might never have been able to add them later one because of how the rafters were located. We tried very hard to incorporate parts of our project that needed to be done right away during the project, but we also tried to think more long term about what we wanted to do. This helped make sure that our future goals were compatible with our current work. 6. Sometimes you just have to settle. I would have loved to have french doors or special sliders along the backside of our addition, but ultimately we had to go with a low cost option of sliders and windows. Nothing fancy, but being willing to compromise was so critical for being able to make our project a reality. If we had an unlimited budget we might have done things differently, and that's ok. It's all about trade-offs. 7. It was worth it. We've started using our extra space now, and I can truly say that we spend most of our time in our new space. When we started planning this addition a year ago we decided that we only wanted to go through with the project if we really thought that the project would dramatically change the way we lived in our house on a daily basis. It has. I feel like there are two different types of changes. The pretty ones and the functional ones. For example, I'd love to change my kitchen (especially my backsplash) but we decided that these cosmetic changes can happen later. Having a craft room and larger place for our family to hang out off of the kitchen changes how our family interacts. My kids are able to create freely with their crafting supplies while I cook, and the new space is a place for crafting, school projects, and a central place to work from home. 8. Design with your life in mind. See those new floors? Well, they are laminate. They continue from the old to the new part of the house. I love real wood floors, but I'm also somewhat obsessive compulsive. Ultimately we decided that laminate flooring was the best option for us, not only because of cost but also because they are super durable. With kids running around and maybe a dog someday, I didn't want to be concerned about scratches all the time. I'm so impressed by how far laminate technology has come. They look so much better than they used to! Alright, finally a picture of our new space, all painted and waiting for trim molding. It's coming together, don't you think? I've started decorating the space and I can't wait for you to see it! What do you guys think? Is this a project that you'd be willing to take on or would you rather move? I'd love to hear!